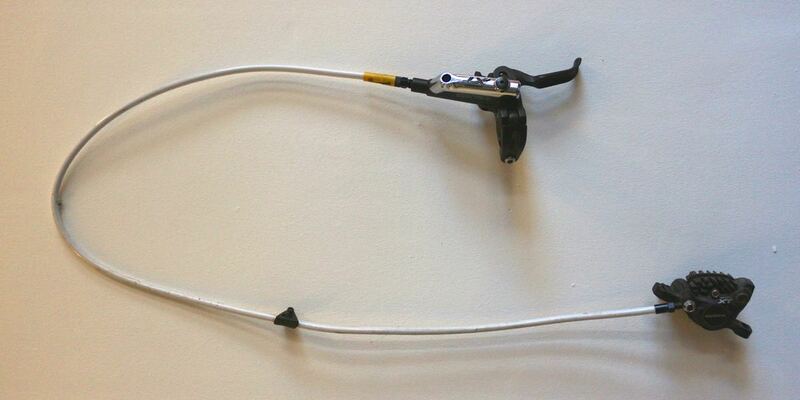 There are many of us who looked at the (retrospectively inevitable) rise of the hydraulic disc brake with a slight degree of suspicion, not least because they seemed so very complicated and – frankly – scary to service or fettle. And when I eventually installed one on the front of my Litespeed in about 2000, I was distinctly underwhelmed. In hindsight, the rotor was too small. The pad yowled and howled, the braking was worse than the v-brake it replaced (in the dry; it was another matter in the wet) and, to cap it all, half way through a multi-day epic, the hose leaked at the caliper. All over the pads. So for several days I yowled even louder than before – and coupled I this ignominy with repeated efforts to burn off the contaminant using a petrol stove. Elegant I was not. Nor discreet. Actually I’m never either of those things. But anyway. At that point I didn’t know enough about disc brake maintenance and so forth to fix things properly myself. I also didn’t know at the time that Goodridge hoses for bikes were already in existence, and promised substantial improvements in performance over the usual flexy plastic ones. The main thrust of this claim was the woven stainless-steel construction of the hose which would impart increased lever feel and maximal braking power due to their lack of expansion under pressure. But I remained sadly ignorant, and I stumbled through my brake career until I found the Shimano brakes I prefer now. So this is the first opportunity I’ve had to put these puppies through their paces. According to its website, Goodridge is “the world’s leading manufacturer of performance fluid transfer systems”. Which essentially means, to you and me, hydraulic hoses. They came into the office as a coil of hose, and a couple of small bags of connectors and widgets (inserts, olives, blah blah) to set them up with my Shimano XT brakes. Hoses and adaptors all come in lots of exciting colours: I plumped for white hoses with black hardware for a Star Wars Stormtrooper look. Installing them was relatively straightforward, once I’d dug about online to find some instructions (none were supplied with our set). There are no little brass inserts to bang in as there are with Shimano hoses – all of that is taken care of with the clever aluminium adaptors and banjos. Once I’d cut the hoses to length (use a decent pair of cablecutters for this) I simply pushed the collar over the outer, pushed the banjo in, and screwed the two together. The hoses were attached to the callipers using the provided o-rings, although I had to re-use a Shimano hollow bolt on the caliper as the supplied one didn’t have the right fluid routing for my brakes. This wasn’t a problem at all though. And bleeding was as simple/annoying as bleeding always is, depending on your temperament. There were a few weird bends in the hoses initially, caused by coiling the hose in its packaging, but these fell out after a day or so. …as was the lever end. a couple of small spanners and some decent cutters was all I needed. And then came the bleeding. In use, in all honesty it’s hard to tell the difference between these and the regular, modern Shimano hoses. 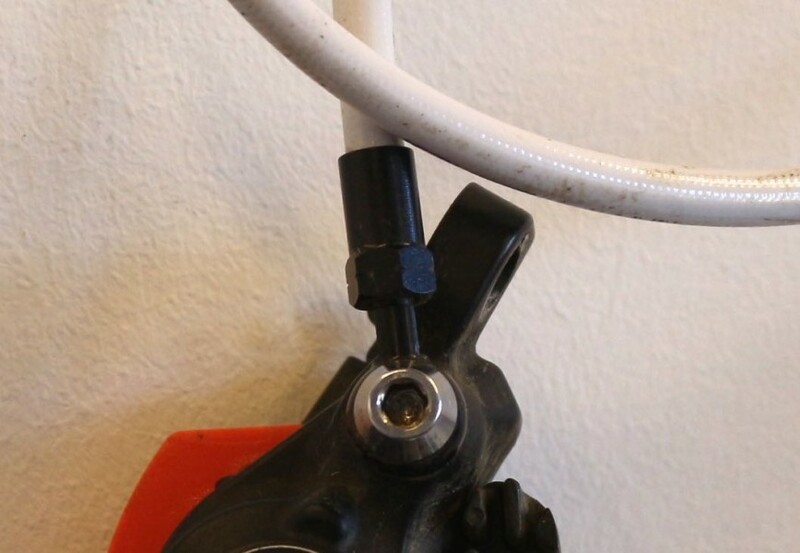 Years ago, there was a notable difference between hoses from different manufacturers, which was dependent on the inherent rigidity of the hoses themselves. But this isn’t necessarily a bad thing – my brakes retained the excellent feel and bite that they had before, and there were no downsides to fitting the Goodridge cables whatsoever. If you’re in the market for a new set of brake hoses, I can’t see a reason why these shouldn’t be at the top of your list. Not overly costly, easier to fit than many manufacturer’s brands – including the generic Shimano ones they replaced – and available in a wide variety of colours to perk up your ride. I used to have a set of Silver Goodridges, now i run Jagwire. 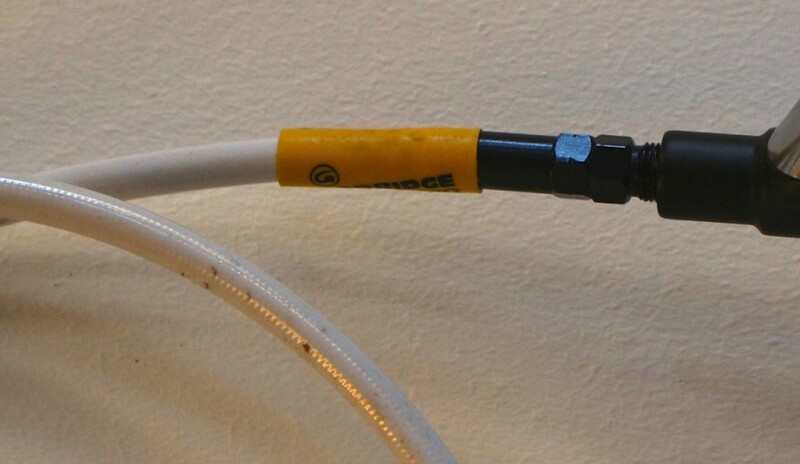 One thing to note is if like me you have an xl or even xxl frame might need to purchase extra cable! I’m confused as to how you find it easier to fit Goodridge hoses than standard hoses. With Goodridge you have to cut back the plastic coating before you can fit them – that’s one extra step overall than with normal hoses. Jagwire MTB hydraulic hoses are easier to find than Goodridge, spent ages trying to get good british product that no one stocked. Gave up and went to the Taiwanese pimpmasters.